EBR Systems has secured $50m funding to carry out pivotal clinical trial, which will assess the safety and efficacy of wireless stimulation endocardially (WiSE) technology. The funding round was led by Australian private equity firms M.H. Carnegie & Co and Brandon Capital Partners. Other investors include Split Rock Partners, Ascension Ventures and Dr. Thomas Fogarty’s Emergent Medical Partners. EBR will conduct stimulation of the left ventricle endocardially (SOLVE-CRT) study to evaluate the safety and efficacy of WiSE technology. The data gathered from the global heart failure trial will be used to secure approval for the technology from the US Food and Drug Administration. WiSE technology is claimed to be the only wireless and endocardial pacing system that will stimulate left ventricle of the heart. The technology will enable cardiac pacing with a novel cardiac implant, which is about the size of a large grain of rice. 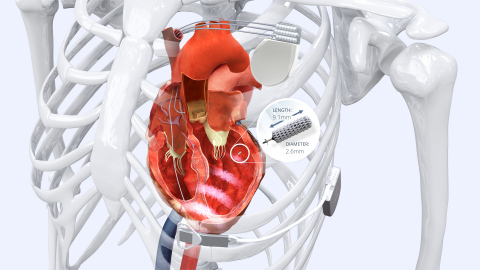 The firm has developed the patented and advanced technology to avoid the use of cardiac pacing leads, which create more complications and lead to reliability issues in cardiac rhythm disease management. Image: EBR’s WiSE technology will eliminate the need for coronary sinus leads to stimulate the left ventricle. Photo: courtesy of Business Wire.